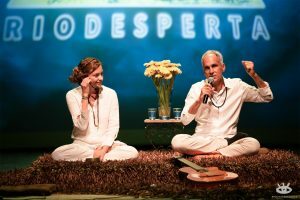 On November 4, the event Rio Desperta, (free translation Rio Awake) took place, a great event that brought together different meditation traditions in the Brazilian city. 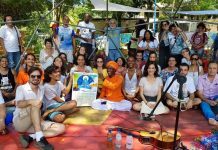 The event was conceived and organized by the Brazilians Gunatiita and Taruna Deva (Telmo Maia), margiis who also teach meditation to the public as a tool of self-knowledge and social transformation. They envisioned a large event and went after ways to accomplish it: “We thought about giving up a few times, because we ran out of sponsorship, and times it seemed unfeasible,” says Taruna Deva. “But our partners encouraged us to continue,” adds Gunatiita. Since many production details were already in place, volunteers and partners were committed to holding the event even in the lack of sponsorship. 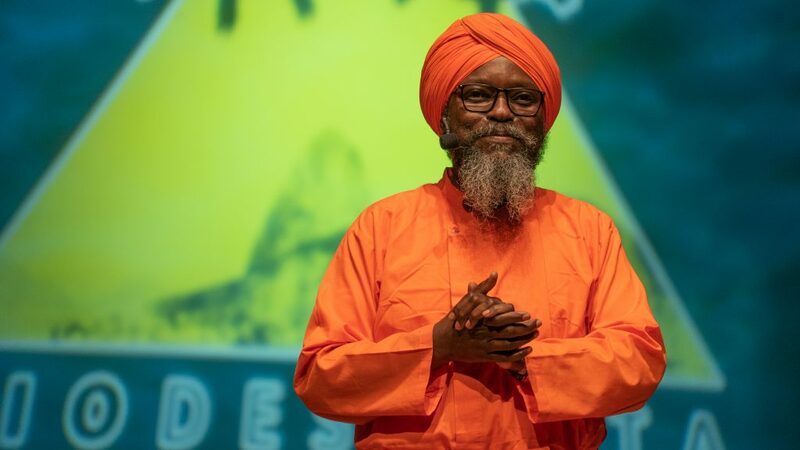 “At a given point, we realized that we had put together a team of great professionals, all involved in the purpose of disseminate meditation to a large audience,” reveald the duo, who at the end of the event were visibly moved by the size of the performance. 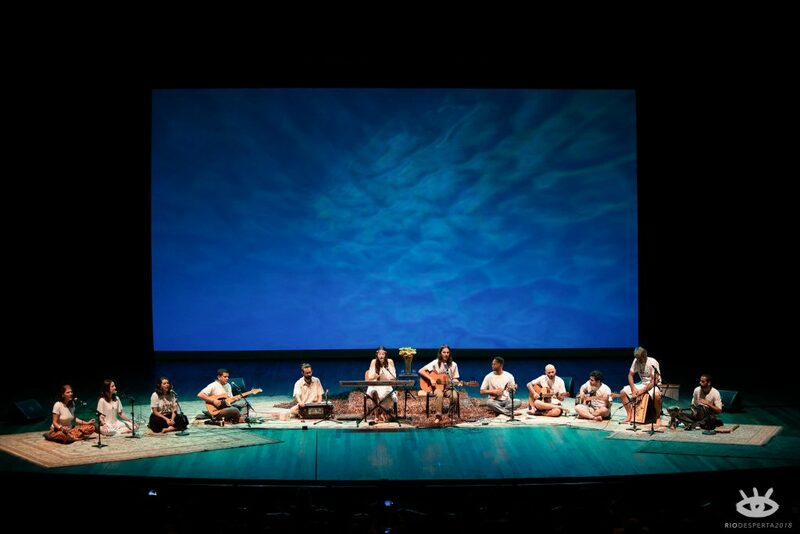 The Grand Hall of the Cidade das Artes (City of Arts), in the Barra da Tijuca district, a noble venue for events in Rio de Janeiro, accommodated a very eclectic audience, who took advantage of the lectures, sang and danced mantras and experienced various forms of meditating. Among the speakers were Klebér Tani, exponent of Transcendental Meditation; Oberon, who spoke about veganism and meditation, within the theme “The World is Hungry for Love”; the teacher of Vedanta Gloria Arieira; Monk Coen, with Buddhist philosophy; Damien Desnos, instructor of Mindfulness; Gunatiita herself and Taruna Deva, of the Una Meditation; Acarya Jinanananda Avadhuta, who spoke about society, neo-humanism and PROUT; and lastly, Rajshree Patel, instructor and international lecturer of the Art of Living. In the interval of the lectures, four bands of bajhans (devotional songs), kiirtans and mantras appeared – among them a collective of twelve margiis, that brought the kiirtan Baba nam kevalam to the public. Dada Jinanananda, who shared some of Ananda Marga’s philosophy in the event, he skillfully led the audience to the understanding of PROUT. Time with humor, time with seriousness, always with simple and direct language, he spoke about the political polarization we are living – not only in Brazil, but in the world. He also explained the need to subtilize the energy so that we can move from the vibration of the most basic cakras to vibrate in the energy of love. The event Rio Desperta was, in fact an event made by all, for the good of all. For many who have watched, renewed hope and the feeling that it is our responsibility for our own happiness. Next articleInspire and provoke – what do you expect of us?